If you're looking for a high-performance motorcycle that's lightweight and compact, one that specialises in adventure touring with the ability to explore further offroad when the tarmac ends, then look no further than the KTM 790 ADVENTURE. This sporty travel bike, with KTM's offroad genes, is built for endless travel enduro exploration and holds huge potential for offroad riding. Whether it's in the desert, on remote mountain trails or a transcontinental crossing, no other twin-cylinder travel enduro bike can match it. The KTM 790 ADVENTURE is a versatile motorcycle that's ready to explore further in any conditions. It's well balanced and purposeful, with sporty handling on the tarmac, and inspires confidence inspiring offroad. The advanced tubular CroMo steel frame and lightweight steel trellis subframe are engineered to be compact, but durable, to handle a full load on longer rides. A steering damper aids stability, while the heavy-duty spoked 21-inch front and 18-inch rear wheels are specifically developed for offroad riding performance. The KTM 790 ADVENTURE's ergonomics allow it to perform as brilliantly offroad as is does on. A low-slung fuel tank lowers the centre of gravity, improves handling, and allows the rider to move around more freely. At high speeds on the open road, the 790 ADVENTURE benefits from a higher screen, which offers maximum wind protection, while the twin-seat design ensures both rider and passenger are comfortable on longer trips. The bodywork on the KTM 790 ADVENTURE has been kept to a minimum. The robust plastics have been manufactured in color to retain their appearance in case of scratching. The tank spoilers and rear side panels are slightly wider than the seat for improved control and to reduce wear and tear on the seat. The LED headlight mask is reduced, taking design cues from KTM's rally bikes to create a slim, lightweight front end. The 790 ADVENTURE is available in two color options: orange and white. 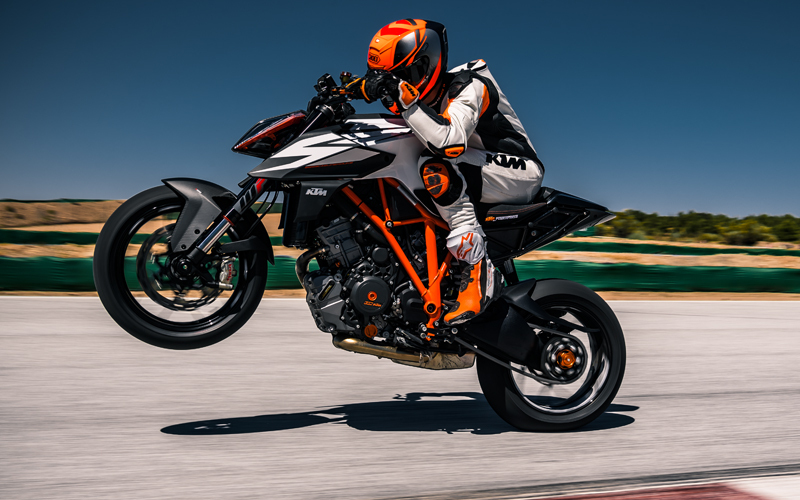 Ride modes allow the rider to adapt the behavior and feel of the engine, while KTM's lean angle sensitive traction control system (MTC – Motorcycle Traction Control), reduces wheel spin based on the chosen mode or riding situation. KTM's cornering ABS system allows riders to use the full power of their brakes while taking the lean angle of the motorcycle into account. It has an advanced offroad mode that can also be turned off. On an adventure ride, storage space is essential. Tools, camping gear, food – KTM offers a solution for all circumstances. You can choose from a lightweight, lockable aluminum touring case set (two sizes), or waterproof soft sidebags when low weight and flexibility are needed. There's also a quick-lock tank bag for daily essentials and waterproof universal luggage for additional cargo capacity.